Welcome to the whimsical world of Loralie fabrics. 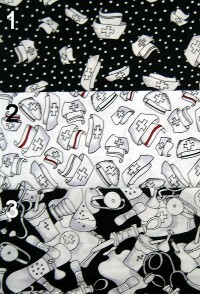 Here you will find Loralie's famous, fun fabric collections, each with a story to tell. The cast consists of quirky ladies, cats and dogs. Each collection includes a panel (the star), novelty prints (the character actors) and coordinating basics (the chorus). Together they put on a colorful, humorous show for your creative pleasure. Enjoy making happy projects to keep, share or just collect! These friendly, fun designs will brighten your sewing room and put a smile on your face.